But more importantly… it’s trip week, Yayyy!! On Friday a few of my best gal pals and I are travelling a few hours to Crop and Create, the radest scrapbooking event in Canada! I couldn’t be more excited to go, and I have a few fun surprises in store for the ladies over the weekend! Today I wanted to share some fun DIY luggage Tags I created. 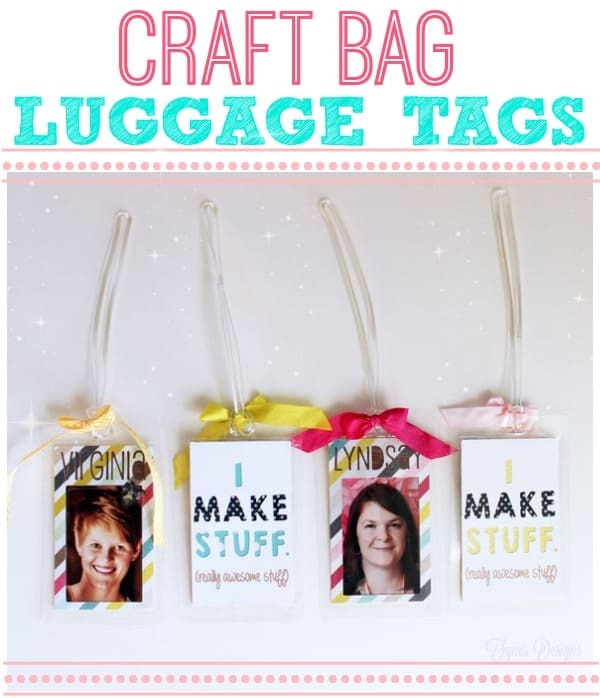 They aren’t your typical tags, but where were not boarding a plane I thought it would be fun to make some personalized tags for our craft luggage, after all our craft supplies are probably more valuable than our regular luggage is! 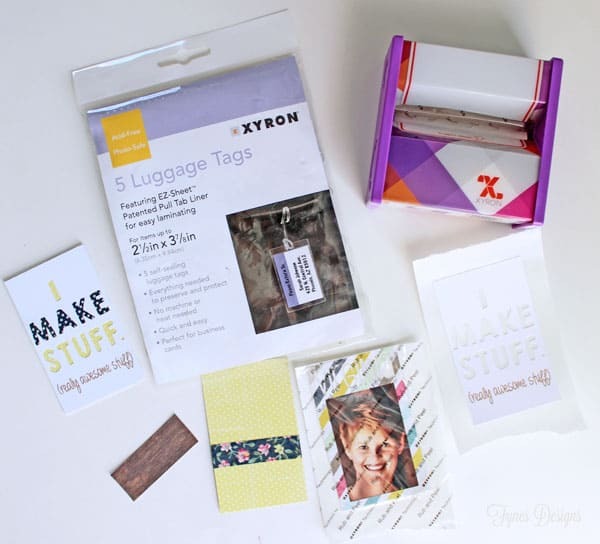 You will need- Xyron EZ-Sheet Luggage Tags, Xyron 3″ Sticker Maker, Pattern Paper (I used My Minds Eye Cut and Paste Collection), I also used my Silhouette for cutting, but you could use letter stickers if you don’t have one, and some May Arts ribbon. I first cut out the images I wanted from cardstock. In this case a back piece that reads “I Make Stuff” not crazy original, I know. For the front a small polaroid with our names and faces. 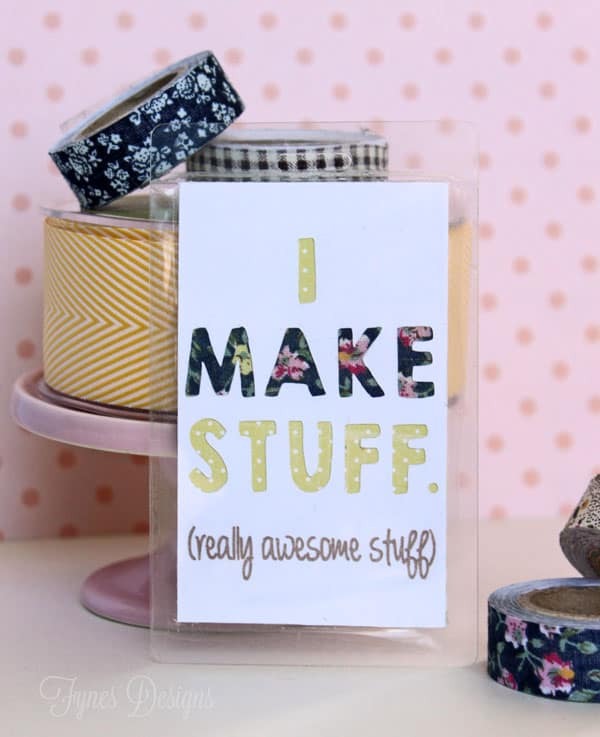 To stick the layers together I used the Xyron 3″ Sticker maker. 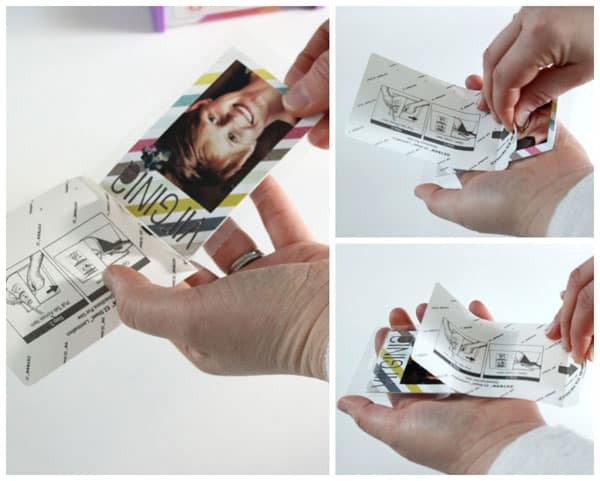 Simply slide the pieces of paper through to get an even layer of adhesive (good side up). Then I stuck the layers together to make a single piece with a front and back (like a business card). Then you’re ready to use the laminating luggage tags. They are SUPER easy to use! Open up the tag, one side will be adhesive, one will be plastic. I recommend if you’re using a photo (they are photo-safe) put it facing the plastic layer (unlike in my photo, I learned the hard way). Then slowly pull the paper tab over your work and viola, instant laminating! From here you can attach the included rubber strap and add a pretty bow, mine is May Arts Ribbon. Can you believe how easy the luggage tags are to use?! I made 4 and I didn’t get any bubbles or wrinkles (although they are forgiving, if you do need to peel it back). I’m very excited to hit the road to Moncton to show off my DIY luggage tags, I can’t wait to be surrounded by so many crafty ladies! Be sure to swing by Wednesday to get a look at my convention style, plus I’ll have a great giveaway too! This is great and goes right along with my post today – My top 10 packing tips! 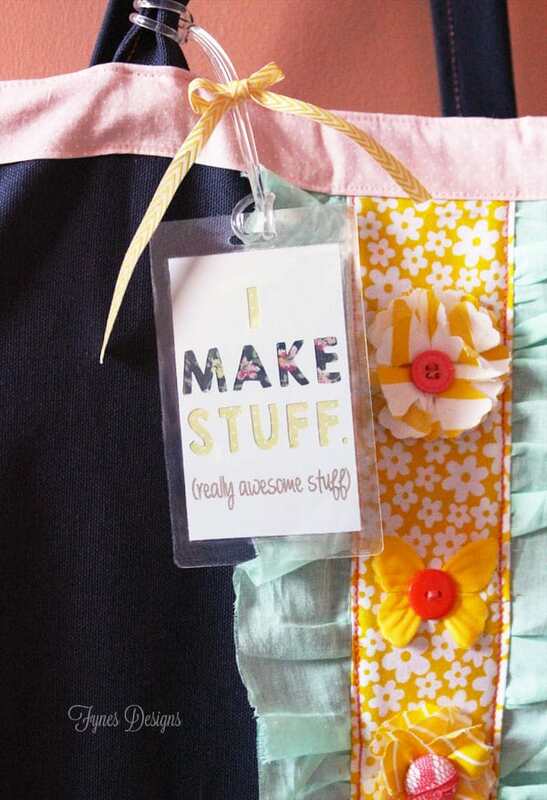 I’ve never thought about making my own luggage tags, so thanks for showing me how to do it. Now I have to bring an equally cute bag to match my awesome luggage tag. Thanks, so excited! Yay! I sooo want one of these! I will see you this weekend at Crop & Create, Virginia! Those are adorable! And I agree, if I *had* to lose a bag of craft supplies vs. my regular luggage, I’d much rather replace clothes and toiletries, LOL! 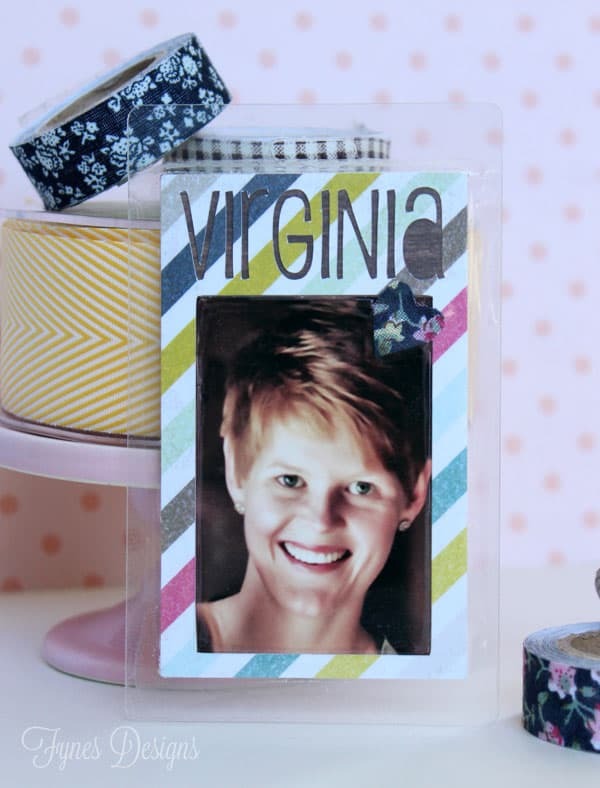 Super cute tags Virginia and have fun at your scrapbooking meet-up, I’m sure you’ll have a great time! Super simple and super cute! My favourite kind of project! Such a great project and lovely way to personalize your bag. Thanks for sharing! They look great, and not that difficult to do! Have a great time in Moncton…wish I could be going, sounds like a wonderful experience! I made some luggage tags just like this at ALT! Yours is way cuter. Great job. Thanks Brooke! Makers gotta make!